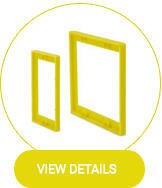 Use the ¼” ReceptXtenders to shim out for paneling or ceramic tiles. Single gang and two gang available. Use the 3/8” ReceptXtenders to shim out for ceramic tile or drywall. Single gang and two gang available. Use the ½” ReceptXtenders to shim out for drywall. Single gang and two gang available. Use the ¾” ReceptXtenders to shim out for barn board or ship-lap. Single gang and two gang available. Stop! Do not be fooled by imitations. Receptxtenders are the original and still the best UL Listed Extender. Receptacle Box Extenders to Save Your Sockets! You might have had a remodeling mishap where ceramic tile backsplashes or wall paneling were laid over the existing electrical outlet boxes, or maybe your drywall wasn’t installed properly, either way, you’re left with a recessed electrical box that is not flush with the front face of the wall surface. This is where receptacle outlet box extenders come in to save the day. Protecting your electrical sockets and securing the wiring inside, box extenders, as the name suggests, extend the electrical box forward so that it lies flush with the wall surface, as is required by electrical code. 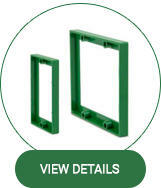 Receptacle box extenders help create a code-compliant enclosure to secure the wire connections and provide a solid foundation for the receptacle. 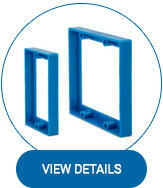 The patented rear flange assures ReceptXtenders fit your box. Steel, old work, new work, PVC or any style box and Receptxtenders fits and meets code. 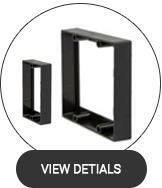 Buy double and single gang box extenders from ReceptXtenders today! Use the ¾” ReceptXtenders to shim out for barn board or ship- lap. Single gang and two gang available.